2. Place kombu and aduki beans in a pot. 3. Cover with water at 2 inches above the level of the beans. 4. Bring water to boil. 6. Cover and simmer for 1 hour. 7. Check periodically, adding extra water if necessary so beans do not dry out or stick to pot. 8. Allow beans to cook until they are soft enough for your taste. Add salt. 9. Drain excess water if necessary. • To check for softness, take a couple of beans out from your pot and squeeze them between your thumb and pointer finger. If beans press easily, they are finished. If they feel hard in the middle, they need more time. 1. Cover the beans with water and soak for 8 hours. 2. Discard soaking water, rinse beans, and place in a pot with kombu and water and cover by 2 inches. 3. Boil gently for 1 hour. 4. Meanwhile, sauté onion and garlic in olive oil covered for 10 minutes. 5. Add carrots and continue cooking covered for 10 more minutes. 6. Add onion mixture to the beans. 7. Continue cooking beans for 30 more minutes. 8. Add mirin and tamari, plus salt and pepper to taste. • Try adding fresh herbs near the end of the cooking time, such as thyme or parsley. 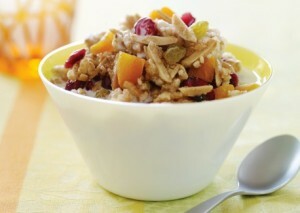 Use this recipe as a model for other granola combinations with different dried fruits, nuts, and spices. It should stay crisp for a week stored in an airtight container. If it loses its crunch, toast 3 to 5 minutes in a 350°F oven. Note: substituting agave or brown rice syrup for the honey and oil for the butter will result in a less crisp granola with smaller clusters. 2. Crumble rice cakes in bowl until only 1/4-inch-or-smaller pieces remain. Stir in quinoa flakes and almonds. 3. Melt together honey, butter, and vegetable oil in saucepan over low heat. Stir in cinnamon. Stir honey mixture into rice cake mixture until well coated. Spread on baking sheet, and bake 10 minutes. Stir, and bake 10 minutes more, or until granola is golden-brown. Cool on baking sheet. Break granola into small clusters. Mix in dried fruit.